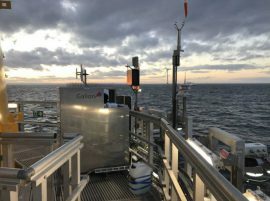 Wood has deployed the first scanning LiDAR (light detection and ranging) devices on two floating wind turbines at the Hywind Scotland Pilot Park located 25 kilometres off the coast of Peterhead in Aberdeenshire, Scotland. 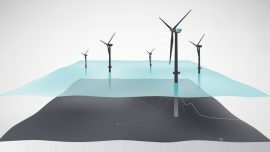 Norwegian energy company Statoil has awarded a contract to Younicos to deliver a 1MW battery system that will be connected to Hywind Scotland, the world’s first commercial floating wind farm. Statoil is currently testing the five Siemens wind turbines on the 30MW Hywind Scotland Pilot Park, the world’s first commercial floating wind farm. 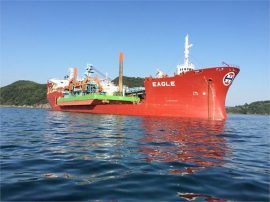 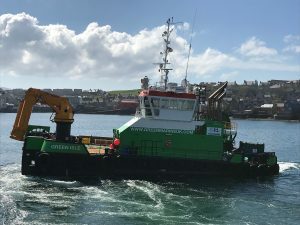 Siem Offshore Contractors’ accommodation and personnel transfer vessel Siem Moxie has begun work on Statoil’s Hywind Scotland, the world’s first floating wind farm. 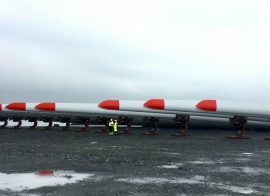 The final floating wind turbine for the Hywind Scotland project has been towed to the site and installed at its designated location off Peterhead, Scotland, according to BBC. 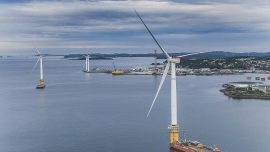 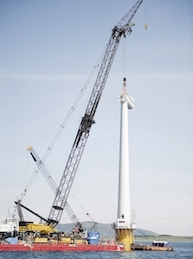 All five Siemens 6MW wind turbines for the Hywind Scotland wind farm have been mounted on their respective floating foundations off Stord, Norway, Statoil reports. 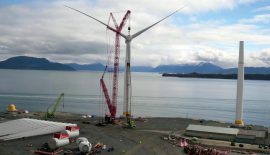 Statoil has shared a great video showing the mating of one of Hywind Scotland’s Siemens 6MW turbines with its SPAR-type floating foundation off Stord, Norway. 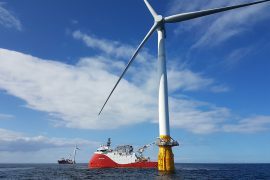 Statoil ASA has through contractor TechnipFMC completed suction anchor installation at Buchan Deep approximately 25 kilometres off Peterhead, Scotland, as part of the Hywind Scotland Pilot Park Project. 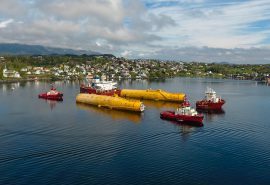 Cargotec’s MacGregor has delivered substructure connection mooring systems for Statoil’s 30MW Hywind pilot park in Scotland, the world’s first floating offshore wind farm. 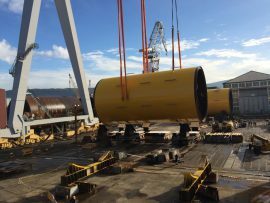 Statoil has started assembling the Siemens 6MW turbines for the 30MW Hywind Scotland floating wind farm at the assembly base in Stord, Norway. 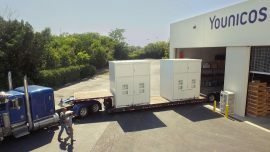 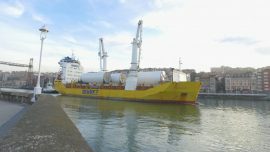 The final tower components for Statoil’s 30MW Hywind Scotland floating wind farm have left Navacel’s facility in Bilbao and have been delivered to the assembly base in Norway. 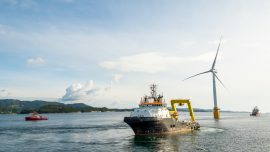 Aibel has been awarded further work on Hywind Scotland Pilot Park after Statoil assigned the company to assist with the commissioning of five floating wind turbines for the project. 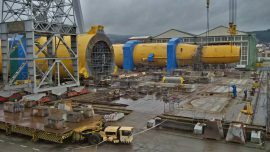 Navantia-Windar today assembled the first foundation for the Hywind Scotland floating wind farm, with the construction of the remaining four well underway, the Spanish joint venture company informed. 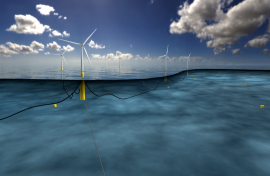 Statoil has agreed to divest 25% of its assets in Hywind Scotland pilot park, the world’s first floating wind farm, to Masdar.